WARNING Even in vehicles with air bags, you and your passengers must always wear the safety belts provided in order to minimize the risk and severity of injury in the event of a collision or rollover. What your airbag system does Driver’s airbag and front passenger’s airbag are designed to supplement the protection offered by the safety belt in certain frontal collisions. Likewise, side airbag and curtain airbags are designed to supplement the protection offered by the safety belt in side collisions. Safety belts are designed to reduce the injury of the driver or passengers in case of impact or collision. No safety belt or airbag system can completely eliminate injuries that may cause in collisions or impacts. To help reduce impact on driver or passengers in any collision, safety belts must be correctly worn. What your airbag system does not do The air bag system is designed to supplement the protection offered by the safety belt system. IT IS NOT A SUBSTITUTE FOR THE SAFETY BELT. The importance of using safety belts There are four very important reasons to use safety belts even with an airbag supplemental restraint system. They: • help keep you in the proper position (away from the airbag) when it inflates. • reduce the risk of harm in rollover, side impact (vehicles not equipped with side and curtain airbags) or rear impact collisions, because an airbag is not designed to inflate in such situations and even a side curtain airbag is designed to inflate only in certain side impact collisions. • reduce the risk of harm in frontal or side collisions which are not severe enough to actuate the airbag supplemental restraint system. • reduce the risk of being ejected from your vehicle. Your vehicle’s Supplemental Restraint System Control Module is equipped with a recording device that may record the use or status of the safety belt restraint system by the driver and front passenger in certain collisions. WARNING - Airbags & safety belts • Even in vehicles with air bags, you and your passengers must always wear the safety belts provided in order to minimize the risk and severity of injury in the event of a collision or rollover. • Always wear your safety belt. It can help keep you away from the air bags during heavy braking just before a collision. • If occupants are not wearing safety belts or correctly seated, they cannot be fully protected, and thus face a greater risk of serious injury or death. • Driver’s and front passenger’s airbag are designed to inflate only in certain frontal collision, and side and curtain airbags are designed to inflate in certain side impacts. Frontal airbags are not designed to provide protection in side impacts, rear impacts, rollovers, or less severe frontal collisions. They will not provide protection from later impacts in a multiimpact collision. • If your vehicle has been subjected to flood conditions (e.g. soaked carpeting/standing water on the floor of the vehicle, etc.) or if your vehicle has become flood damaged in any way, do not attempt to start the vehicle or put the key in the ignition. Have the vehicle towed to an authorized Kia dealer for inspection and necessary repairs. Disregarding this precaution may cause an unexpected airbag deployment, which could result in serious personal injury or death. The SRS uses a collection of sensors to gather information about the driver’s and front passenger’s seat position, the driver’s and front passenger’s safety belt usage and impact severity. The driver's and front passenger's seat position sensors, which are installed on the seat track let the airbag control module know where the seats are positioned. Similarly, the safety belt usage sensors measure if the driver and front passenger’s safety belts are fastened.These sensors provide the ability to control the SRS deployment based on how close the driver’s seat is to the steering wheel, how close the passenger’s seat is to the instrument panel, whether or not the safety belts are fastened, and the severity of the impact. to control the airbag inflation with two levels. A first stage level is provided for moderate-severity impacts. A second stage level is provided for more severe impacts. According to the impact severity, seating position and safety belt usage, the SRS Control Module controls the airbag inflation. Additionally, your SRS is equipped with an occupant classification system in the front passenger’s seat. The occupant classification system detects the presence of a passenger in the front passenger’s seat and will turn off the front passenger’s airbag under certain conditions in order to protect smaller front passenger seat occupants. For more detail, see “Occupant Classification System” later in this section. WARNING - Seating sensors malfunction If the seat position sensor is not working properly, the airbag warning light ( ) on the instrument panel will illuminate because the airbag warning light is connected with the seat position sensor. If the airbag warning light does not illuminate when the ignition key is turned to the "ON" position, if it remains illuminated after illuminating for approximately 6 seconds, or if it illuminates while the vehicle is being driven, have an authorized Kia dealer inspect your vehicle as soon as possible. WARNING - Seat usage • Modification to the seat structure can damage the seat position sensor and cause the airbag to deploy at a different level than should be provided. • Do not place any objects underneath the front seats since they could damage the seat position sensor or interfere with the occupant classification system. • Do not place any objects that may cause magnetic fields near the front seat. These may cause a malfunction of the seat position sensor. • Have your car checked by a Kia dealer as soon as possible if the SRS warning light comes on. Ignoring the indicator light can result in serious or fatal injury. • Sitting improperly or out of position can provide incorrect data to the occupant classification system and result in serious or fatal injury in a crash. All occupants should sit upright in their seats with their feet on the floor. Driver’s airbag Your vehicle is equipped with an Advanced Supplemental Restraint (Air Bag) System and lap/shoulder belts at both the driver and passenger seating positions. The driver’s airbag is stored in the center of the steering wheel. WARNING - Steering wheel • You must always sit as far back from the steering wheel airbag as possible (chest at least 250 mm (10 inches) away from the steering wheel), while still maintaining a comfortable seating position for good vehicle control, in order to reduce the risk of injury or death in a collision. 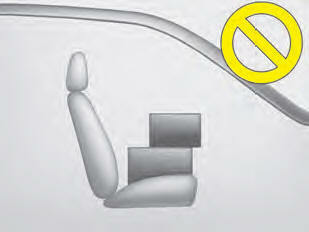 • Never place objects over the airbag storage compartments or between the airbags and yourself. Due to the speed and force of the airbag inflation, such objects could hit your body at high speed and cause severe bodily injury and even death. • Do not put stickers or ornaments on the steering wheel cover. These may interfere with the deployment of the airbag. Front passenger’s airbag Front passenger’s airbag is stored in the instrument panel on the glove box. Never put any objects or ornaments on the instrument panel. Occupant classification system The occupant classification system detects the presence of a passenger in the front passenger’s seat and will turn off the front passenger’s airbag under certain conditions. The occupant classification system is designed to detect the presence of a properly-seated occupant and determine if the front passenger’s airbag should be enabled (may inflate) or not. If there is no passenger in the front passenger seat or if the passenger in the front passenger's seat is very small (such as a child), the front PASSENGER AIR BAG “OFF” indicator may go ON. When this indicator is ON, the front passenger's air bag will not deploy. The side air bag will not deploy if the front seat is unoccupied. The side air bag may deploy if the front seat is occupied by a small occupant. 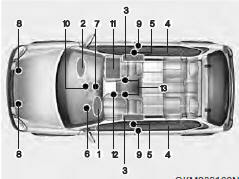 Main components of occupant classification system • A detection device located within the front passenger seat cushion. • Electronic system to determine whether passenger air bag systems (both front and side) should be activated or deactivated. • A warning light located on the instrument panel which illuminates the words PASSENGER AIR BAG “OFF” indicating the front passenger air bag system is deactivated. • The instrument panel air bag warning light is interconnected with the occupant classification system. Always be sure that you and all vehicle occupants are seated and restrained properly (sitting upright with the seat in an upright position, centered on the seat cushion, with the person’s legs comfortably extended, feet on the floor, and wearing the safety belt properly) for the most effective protection by the air bag and the safety belt. • The OCS may not function properly if the passenger takes actions which can defeat the detection system. These include: (1) Failing to sit in an upright position. (2) Leaning against the door or center console. (3) Sitting towards the sides or the front of the seat. (4) Putting legs on the dashboard or resting them on other locations which reduce the passenger weight on the front seat. (5) Improperly wearing the safety belt. (6) Reclining the seat back. • The PASSENGER AIR BAG “OFF” indicator illuminates after the ignition key is turned to the “ON” position or after the engine is started. If the front passenger’s seat is occupied by very small person, the PASSENGER AIR BAG “OFF” indicator will remain illuminated. If the front passenger’s seat is occupied by a person of adult size, the PASSENGER AIR BAG “OFF” indicator will turn off after 4 seconds. • If the front passenger's seat is unoccupied, the PASSENGER AIR BAG “OFF” indicator will turn on, and the front passenger's airbag will not deploy in frontal crashes. • If the PASSENGER AIR BAG “OFF” indicator illuminates, the front passenger’s airbag will not deploy in frontal crashes. • If the front passenger’s seat is occupied by a person of adult size, the PASSENGER AIR BAG “OFF” indicator is not illuminated and the front passenger’s airbag will deploy in frontal crashes. *1 The system judges a person of adult size as an adult. When a smaller adult sits in the front passenger seat, the system may recognize him/her as a child depending on his/her physique and posture. *2 When a larger child who has outgrown a child restraint system sits in the front passenger seat, the system may recognize him/her as an adult depending on his/her physique or posture. CAUTION If the PASSENGER AIR BAG “OFF” indicator illuminates or blinks continuously when a person of adult size sits in the front passenger’s seat, it could be because that person isn’t sitting properly in the seat. If this happens, turn the vehicle off, place the seat back in the full upright position, sit upright in the seat, centered on the seat cushion, with legs comfortably extended. Restart the vehicle and have the person remain in this position for about 1 minute. This will allow the system to detect the person and enable the passenger’s airbag. CAUTION If the occupant classification system is not working properly, the airbag warning light ( ) on the instrument panel will illuminate because the passenger’s airbag is connected with the occupant classification system. If there is a malfunction of the occupant classification system, the PASSENGER AIR BAG “OFF” indicator will illuminate and the front passenger's airbag will not deploy in frontal crashes even if there is adult occupant in the front passenger's seat. Have an authorized Kia dealer inspect the occupant classification system with the SRS airbag system as soon as possible if any of following occur; • The SRS airbag warning light does not illuminate when the ignition key is turned to "ON" position. • The SRS airbag warning light remains illuminated after illuminating for approximately 6 seconds. • The SRS airbag warning light illuminates while the vehicle is being driven. WARNING If the front passenger seat should be modified for persons with disabilities that may affect the operation of the occupant classification system, contact an authorized Kia dealer. WARNING • The occupant classification system can function only when the ignition key is in the "ON" position. • For very small person, the occupant classification system may or may not turn off the right front passenger's frontal airbag, depending upon the person's seating posture and body build. Everyone in your vehicle should wear a safety belt properly -- whether or not there is an air bag for that person. • If the front seat passenger changes their seating position (for example, by not sitting upright, by sitting on the edge of the seat, or by otherwise being out of position), the PASSENGER AIR BAG “OFF” indicator may be turned on, and the passenger's airbag may not deploy in a collision. Always be sure to sit properly in the front passenger’s seat and wear the safety belt properly and do not do any of the following. - Put a heavy load in the front passenger seat. - Excessively recline the front passenger seatback. - Sit with hips shifted towards the front of the seat. - Lean on the center console. - Sit on one side of the front passenger seat. - Place feet on the dashboard. 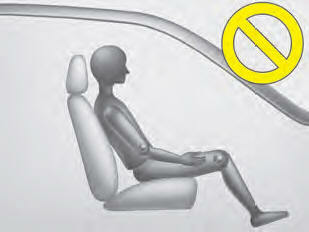 • Do not modify or replace the front passenger’s seat. Don't place or attach anything on the front passenger’s seat. This can adversely affect the occupant classification system. 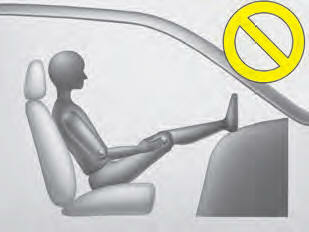 • Do not sit on sharp objects such as tools when occupying the front passenger’s seat. These can adversely affect the occupant classification system. • Do not install accessory seat covers on the front seats. NOTICE • If luggage or other objects are placed on the front passenger's seat or if the temperature of the seat changes, the PASSENGER AIR BAG “OFF” indicator may blink. These conditions do not indicate a problem. • Do not put heavy objects on the front passenger’s seat. This may cause the front passenger's airbag to deploy in a frontal collision. WARNING • The front seat passenger’s airbag is much larger than the steering wheel airbag and inflates with considerably more force. It can seriously hurt or kill a passenger who is not in the proper position and wearing the safety belt properly. The front passengers should always move their seat as far back as practical and sit back in their seat. • It is essential that the front passengers always wear their safety belts, even when the vehicle is moving in a parking lot or up a driveway into garage. • If the driver brakes the vehicle heavily in an urgent situations, occupants will be thrown forward. If front passengers are not wearing the safety belts, they will be directly in front of the storage compartment when inflation occurs. In that situation, serious injury or death is possible. • Never allow front passenger to put their hands or feet on the instrument panel or put their face close to the instrument panel. The airbag will impact the front passenger when it inflates. • Never allow children/old and feeble persons/pregnant women to sit on the front passenger’s seat. Do not put child restraint systems on the front passenger’s seat either. They may be seriously injured by the airbag inflation when airbag deploys. • Do not put objects or stickers on the instrument panel. Do not apply any accessory on the front windshield glass or do not install aftermarket mirrors or accessories on the factory installed rearview mirror. These may interfere with the deployment of airbag inflation or could hit your body at high speed and cause severe bodily injury and even death. Side airbag (if equipped) Side airbags are stored in the left side of the driver’s seat, right side of the front passenger’s seat. If airbag inflation conditions are met (side collision), they will inflate. WARNING - Seat covers, damage and modifications • Do not use any accessory seat covers for a vehicle equipped with side airbags. Use of seat covers could interfere with side airbag deployment. If seat is damaged, have the vehicle inspected by an authorized Kia dealer. Inform them that your vehicle is equipped with side airbags. • Do not make modifications or additions to the seats since injury may result in due to the malfunction of the airbag system. Curtain airbag (if equipped) Curtain airbags are located along both sides of the roof rails above the front and rear doors. They are designed to help protect the heads of the front seat occupants and the rear outboard seat occupants in certain side impact collisions. 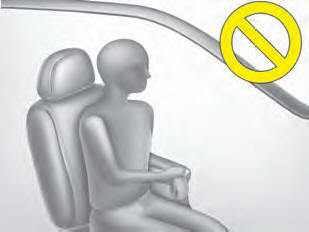 • The curtain airbag deployment occurs only on the side of the vehicle affected by the impact. • The side airbags (side and curtain airbags) are not designed to deploy during collisions from the front or rear of the vehicle or in most rollover situations. • The curtain airbags are designed to deploy only during certain sideimpact collisions, depending on the crash severity, angle, speed and impact. The curtain airbags are not designed to deploy in all side impact situations. WARNING • In order for side airbags (side and curtain airbags) to provide their best protection, occupants should sit in an upright position with the seat belts properly fastened. • Children must be seated in the proper child restraint system. Make sure to secure the child restraint system in a locked position. • Advise occupants not to lean their heads or bodies onto doors, and not to place objects between the doors and them since this may defeat operation of the side airbags. • Never try to open or repair any components of the side curtain airbag system. This should only be done by an authorized Kia dealer. Failure to follow the above mentioned instructions can result in injury or death to the vehicle occupants in an accident. Why didn’t my airbag go off in a collision? (Inflation and non-inflation conditions of the airbag) There are many types of accidents in which one or more of the airbags would not be expected to provide additional protection. These include rear impacts, second or third collisions in multiple impact accidents, as well as low speed impacts. Just because your vehicle is damaged and even if it is totally unusable, don’t be surprised that the airbags did not inflate. WARNING - Protecting airbag module and sensors • Do not hit or allow any heavy objects to hit the locations where airbags or sensors are installed. This may cause damage and unexpected airbag deployment, which could result in serious personal injury or death. • If the installation location or angle of the sensors is altered in any way, the airbags may malfunction, causing severe injury or death. Therefore, do not try to perform maintenance on or around the airbag sensors. Have the vehicle repaired by an authorized Kia dealer. WARNING - Body changes • Problems may arise if the sensor installation angles are changed due to the deformation of front bumper, body or B pillar where side collision sensors are installed. In the event of a collision, have the vehicle inspected by an authorized Kia dealer. • Your vehicle has been designed to deploy the airbag(s) in certain collisions. Installing aftermarket bumper guards or replacing a bumper with non-genuine parts may adversely affect your vehicle’s airbag deployment performance. Airbag inflation condition Front airbag Front airbags are designed to inflate when the impact is delivered to front collision sensors depending on the intensity, speed or angles of impact of the front collision - generally from an area a little to the left to a little to the right of straight ahead. Side airbag Side airbags (side and curtain airbags) are designed to inflate depending on the strength, speed and angles of impact of a side impact collision or rollover. If the vehicle chassis is impacted by bumps or objects on unimproved roads or sidewalks, airbags may deploy. Drive carefully on unimproved roads or on surfaces not designed for vehicle traffic to prevent unintended airbag deployment. Airbag non-inflation conditions • In certain low-speed collisions the airbags may not deploy. The airbags are designed not to deploy in such cases because the risk of injuries which can be caused by the airbags exceeds the benefits they provide in protecting occupants. • In this case, the front airbags do not provide protection, since they would instantaneously inflate and deflate while the occupants were moving away from the front airbags. • Front airbags are also not generally designed to deploy in side impact collisions because occupants are moving sideways ad not forward into the front airbags. However, side or curtain airbags are designed to inflate in side impacts depending on the intensity, vehicle speed and angles of impact. • In a slant or angled collision, the force of impact may direct the occupants in a direction between the front and side airbags, and thus the sensors may not deploy any airbags. • Just before impact, drivers often brake heavily. Such heavy braking lowers the front portion of the vehicle and the vehicle dive under a vehicle with a higher ground clearance. Airbags may not inflate in this "underride" situation because deceleration forces are so radically altered by such "underride" collisions. • Front airbags do not generally inflate in rollover accidents. However, side airbags may inflate during a rollover, depending on the precise impacts which the side of the vehicle experienced during a rollover. • Airbags may not inflate if the vehicle collides with objects such as utility poles or trees, where the point of impact is concentrated to one area and not the main body structures, so that the full force of the impact is not transmitted to the sensors. How does the airbag system operate • Airbags only operate when the ignition switch is turned to the ON or START positions. • Airbags inflate instantly in the event of serious frontal or side collision in order to help protect the occupants from physical injury. The airbag Electronic Control Unit (ECU) is a small computer which calculates the immediate impact information and sends out a deployment signal based on the ECU's calculation of the likely severity of the developing collision. • There is no single vehicle speed at which the airbags will inflate. • Airbag deployment depends on a number of factors including vehicle speed, angles of impact and the density and stiffness of the vehicles or objects which your vehicle hits in the collision. However, factors are not limited to those mentioned above. • The front airbags will completely inflate and deflate in an instant. It is impossible for you to see the airbags inflate during an accident. It is much more likely that you will simply see the deflated airbags hanging out of their storage compartments after the collision. • In order to help provide protection in a severe collision, the airbags must inflate rapidly. The speed of airbag inflation has been determined by the Canadian Motor Vehicle Safety Standard (CMVSS) to reduce the likelihood of serious or life-threatening injuries and is thus a mandatory part of the airbag design. However, airbag inflation can also cause injuries which normally can include facial abrasions, bruises and broken bones, and sometimes more serious injuries because that inflation speed also causes the airbags to expand with a great deal force. • There are even circumstances under which contact with the steering wheel airbag can cause fatal injuries, especially if the occupant is positioned excessively close to the steering wheel. WARNING - Seated positioning • Driver should sit as far back from the steering wheel airbag as possible to reduce the risk of injury or death in a collision (at least 250 mm (10 inches) away). The front passenger should always move their seat as far back as possible and sit back in their seat. • Airbags inflate instantly in an event of collision and passengers may be injured by the airbag expansion force if they are too close to the dashboard. • Airbag inflation may cause injuries which normally include facial or bodily abrasions, injuries from broken eyeglasses or burns from the airbag gases. Noise and smoke When the airbags inflate, they make a loud noise and they leave smoke and powder in the air inside of the vehicle. This is normal. After the airbag inflates, you may feel substantial discomfort in breathing due to the contact of your chest to both the safety belt and the airbag, as well as from breathing the smoke and powder. We strongly urge you to open your doors and/or windows as soon as possible after impact in order to reduce discomfort and prevent prolonged exposure to the smoke and powder. Though the smoke and powder are non-toxic, they may cause irritation (eyes, nose and throat etc). Wash and rinse with cold water immediately and consult the doctor if the symptom persists. WARNING - Hot airbag parts When the airbags deploy, the airbag related parts in steering wheel and/or instrument panel and/or in both sides of the roof rails above the front and rear doors are very hot. 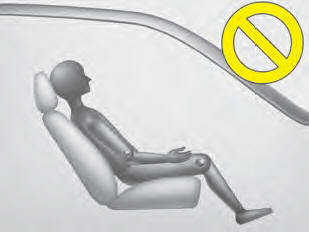 To prevent injury, do not touch the airbag storage area’s internal components immediately after an airbag has inflated. Installing a child restraint on a front passenger’s seat is forbidden. Never place a rear-facing child restraint in the front passenger’s seat. If the airbag deploys, it would impact the rear-facing child restraint, causing serious or fatal injury. In addition, do not place front-facing child restraint in the front passenger’s seat either. If the front passenger airbag inflates, it would cause serious or fatal injuries to the child. WARNING - Child restraints • Never put a child restraint in the front passenger’s seat. If the front passenger airbag inflates, it would cause serious or fatal injuries. • When children are seated in the rear outboard seats, be sure to secure the child restraint system into a locked in position. Airbag warning light The purpose of the airbag warning light in your instrument panel is to alert you of a potential problem with your airbag - Supplemental Restraint System (SRS). When the ignition switch is turned ON, the indicator light should illuminate for approximately 6 seconds, then go off. Have the system checked if: • The light does not turn on briefly when you turn the ignition ON. • The light stays on after the engine starts. • The light comes on while the vehicle is in motion. Airbag (Supplemental Restraint System) service Your Supplemental Restraint System is virtually maintenance-free. There are no parts which you can service. You must have the system serviced under the following circumstances: • If an airbag ever inflates, the airbag must be replaced. Do not try to remove or discard the airbag by yourself. This must be done by an authorized Kia dealer. • If the airbag warning indicator light alerts you to a problem, have the airbag system checked as soon as possible. 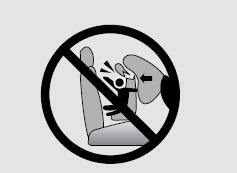 Otherwise, your airbag system may be ineffective. WARNING - No modifications Do not modify any part of the airbag system modification could make the airbag system ineffective. WARNING - No maintenance or repair • Do not work on the airbag system’s components or wiring. This could cause the airbags to inflate inadvertently, possibly seriously injuring someone. Working on the system could also disable the system so that the airbags would not deploy in a collision. • Any work on the airbag system, such as removing, installing, or repairing the steering wheel must be performed by a qualified Kia technician. Improper handling of the airbag system including the steering wheel may result in serious personal injury or death. When repairing or scrapping the vehicle • Repairing the steering wheel, instrument panel, center console or roofs, or installing a car audio system around the center console or painting the front metal sheet could disable the airbag system. Have such repairs and maintenance performed by an authorized Kia dealer. • Special care must be taken in scrapping or junking an airbagequipped vehicle. Always refer such activities to a qualified professional. Airbag warning label Airbag warning labels which are now required by the Canadian Motor Vehicle Safety Standard (CMVSS) are attached to alert driver and passengers of potential risk of airbag system. Note that these government warnings focus on the risk to children, Kia also wants you to be aware of the risks which adults are exposed to. Those have been described in previous pages.